When I recently started a list of my favourite waterfalls in Nova Scotia, I quickly realized that many of them are in Cape Breton. Cape Breton has so much to offer, but it’s a destination in and of itself for waterfall hunting. 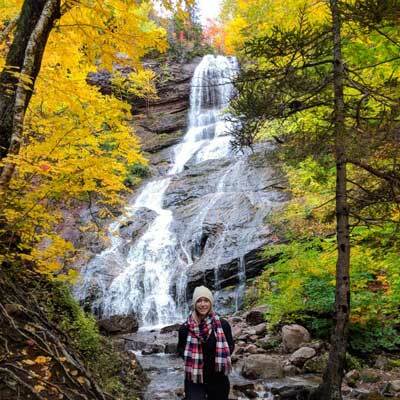 These are five incredible waterfalls to visit in Cape Breton featuring a range of shapes, sizes, and hiking distances. There are some you can stack together to visit in a single day, while others you’ll need to dedicate a whole day to finding. 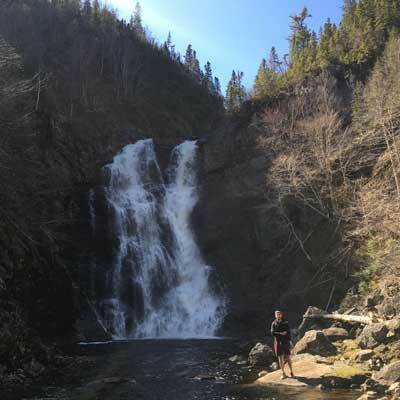 Either way, be sure to add these waterfalls to your to-see list on your next trip to Cape Breton! 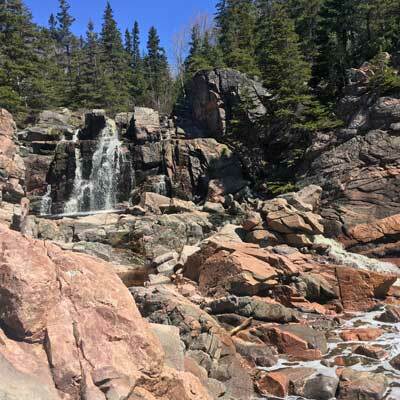 Named for the Gaelic term for white water, this 50 foot waterfall is located in the provincial park of the same name. There is about 2km of trail in the park, and the walk to the falls is nice and easy. Just follow the river upstream to get to the falls. An easy walk 200m from the parking lot, Mary Ann Falls is a 20 foot cascade in a little park with a bridge crossing the river and a viewing platform next to the falls. a Apparently, the pool formed at the base of falls is swimming area in the summer, although the pull looks like it would be pretty strong. The road that leads to the parking area is dirt, but is in decent shape. That said, when we attempted to visit last May it was closed (spring maintenance?) but I was glad we tried again in October. If for some reason you visit and it’s closed, it would be feasible to walk in. I’m not certain whether this waterfall has an official name—I haven’t been able to find one online—but what I do know is that this area is a little corner of paradise. The combination of the beach and the waterfall is almost too good to be true: red and white stones lining the coast contrast with emerald green ocean water, while the horseshoe shaped waterfall cascades through rock and flows into the ocean. Spectacular! The best view of the waterfall from its base. From the beach, we climbed large rocks to get closer to it. We couldn’t access the waterfall directly at high tide, but you might be able to at lower tide. That said, you wouldn’t want to get stuck there—so be mindful and proceed with caution. If you wanted to tie a hike in with your visit, the trailhead for Jack Pine Trail is right there and features a nice 2km loop. At 65 feet high, this stunning, steep cascade is a total gimme. Park in the parking area, and the waterfall is right there. That said, if you’ve made the trip here, it is well worth your time to hike Aspy Trail. The parking lot where you’ll find Beulach Ban Falls is also next to the Aspy Trail head. Aspy Trail is a 9km round trip, featuring a gradual climb along the Aspy fault. The well-established trail eventually leads to a breathtaking look off down the Aspy Valley. More about Cape Breton’s best look-offs here. This gorgeous waterfall is the opposite of a catfish: much more impressive in person than in photos. The first time I visited, I was totally overwhelmed—especially in the spring when the water levels are high. This waterfall is made up of two levels, and while only about 25 feet high, is 65 feet wide. The trail to get to the falls, while only 1km and very well marked, is a bit tricky. It’s extremely steep toward the bottom, and you must use the network of ropes that are in place to make your way to the base. Use caution and use your judgement. I saved the biggest and baddest for last! North River Falls is Nova Scotia’s highest waterfall at over 100 feet tall. Exploring this park with the waterfall as your destination means you’ll need to work for the reward. The trail is 9km each way in and out to the falls, so 18km total, and a 6 hour hiking time. This is hands down the toughest hike I’ve done in a single day. 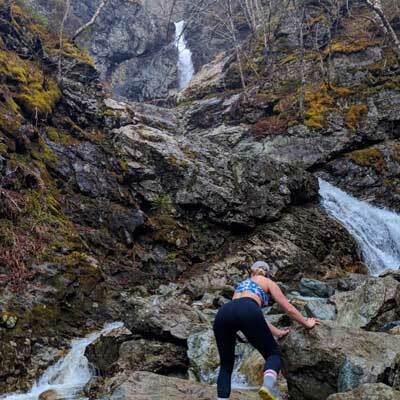 The first part is smooth sailing—the trail follows what looks like a cart path for a stretch—but toward the falls some scaling and scrambling is required. The trail goes through the woods and follows the river, but otherwise, isn’t a ton of visual interest along the way. That said, the falls itself is incredible and is absolutely a bucket list find for dedicated Nova Scotia waterfall chasers! My advice: be prepared. Make sure you have lots of daylight on your side, bring food and lots of water, and wear good hiking shoes—as in comfortable, supportive, and ideally waterproof. When Brett and I visited here last May, we vastly underestimated the time and energy that would be required to get in to the waterfall and out before dark. As a result, we ended up being rushed and only had 30 minutes to stop at the waterfall to rest up, eat, and enjoy the sight before we had to turn around to beat the dark. I’ve only scratched the surface of Cape Breton’s waterfalls here. 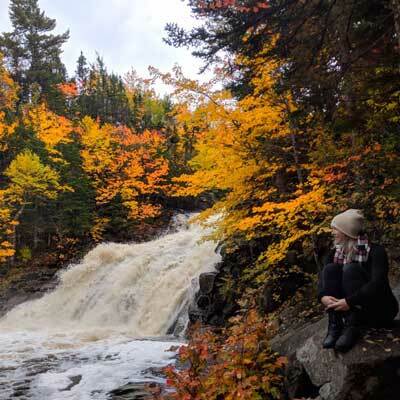 Which of Cape Breton’s waterfalls are your favourites? Let me know in the comments! Yep these are some of CB’s beautiful but somewhat overcrowded waterfalls. If you get the chance get my waterfall book or follow some of my trailpeak.com links to some of the more hidden falls in NS! Hey Ben, thanks for reading! I recognize your name as I’ve discovered a lot of waterfalls via Trailpeak through your recommendations. 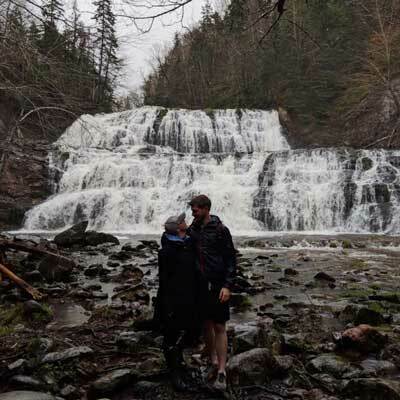 I will need to look up your book as I’d love to support your work in a more concrete way since I have you to thank for many of my favourite waterfalls and hiking trails around the province!